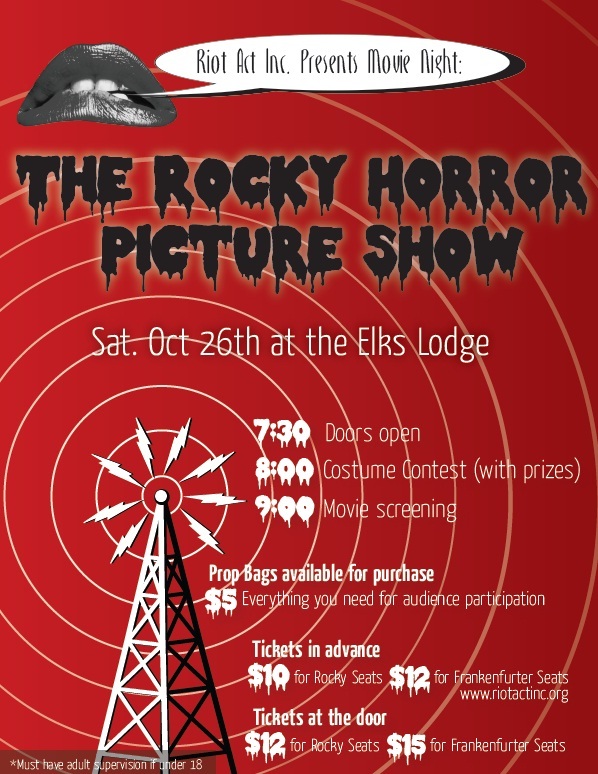 The Rocky Horror Pictureshow – Riot Act, Inc.
Riot Act will be hosting The Rocky Horror Pictureshow*, movie event and costume contest, Saturday, Oct. 26, 2013 at The Elks Lodge. Doors open at 7:30pm, Costume Contest at 8pm, and Movie at 9pm. Ready to do the Time Warp again? Join us for the cult classic The Rocky Horror Pictureshow, the movie. Dress as your favorite character and enter our costume contest with great prizes. Enjoy drinks at the bar (bar area is 21 and over). Spend just $5 more for a prop bag, everything you need for audience participation. Doors open at 7:30pm. Costume Contest starts at 8pm. Movie will begin at 9pm. Tickets available in advance on our website, www.riotactinc.org; $10 for Rocky seats or $12 for Frank-N-Furter seats. 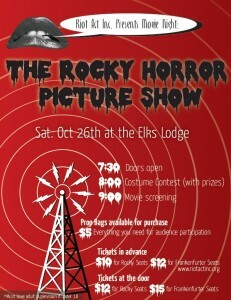 Or at the door for $12 for Rocky seats or $15 for Frank-N-Furter seats. Frank-N-Furter seating gives you VIP status in the front few rows with comfy armchair seating. Movie goers under 18 must be accompanied by an adult or have a note of permission from a parent. *by special permission of Criterion Pictures.